Note that guitar now comes with on line Video Instruction for learning how to play electric guitar. It no longer comes with DVD. A great 1/2 size guitar package at an unbelievable price! 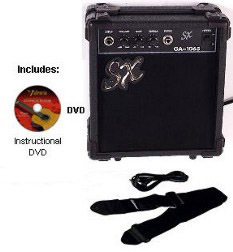 Package features everything you need to start playing: Guitar, Guitar Amp, Instructional Video, Guitar Bag, Strap, and Cable! Perfect for your young beginner! This scaled down guitar is about 4" shorter and 3" more narrow than a full sized guitar. It also makes a great travel guitar. Overall length of guitar: 34 1/2"
This guitar was a Christmas present to my 5yr old... even though he wanted a "blue" First Act brand guitar he LOVED this one. Big jump in quality, it looks cool and sounds great. It fits him perfectly with room to grow. "comes with POCKET Amp that only works with headphones (headphones included)"... We are only into the 1st few chapters of the Video but I love it... great father-son time and is presented as if you are sitting with an instructor. I am following with my acoustic, son picks on his SX. The DVD has Acoustic, Electric, and Bass menu options. The gig bag is perfect and holds everything nicely. - "jsonic "
Question: How does this half sized guitar compare to a full sized guitar? Answer: This scaled down guitar is about 4" shorter and 3" more narrow than a full sized guitar. 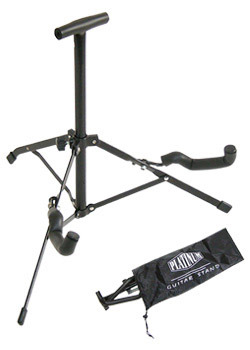 It is great for a young child, to use when traveling, and also for people with bad backs who want a light weight instrument. 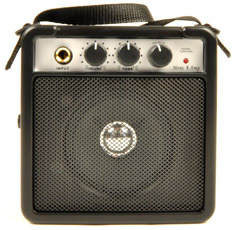 SX GA1065 STCAD 10 Watt Guitar Amplifier$39.95 On Sale!